In my fourth and final contribution to Terrain's blog, I talk toast. More specifically, I talk about how it can actually be part of a whole foods diet. (In case you missed the other three posts, you can see them here, here, and here.) We're wired to think of bread and bad, just like we're wired to think of pasta as bad. But, I'm here to show you that one, life's to short to say no to bread—good bread, that is—and two, the health factor of your toast all depends on what you're topping your bread with. I'm most definitely a peanut butter and banana fan, and I love a coconut butter and avocado toast, but I also love layering on vegetables for a nutritious kick. I don't need to tell you that there's something so satisfying about biting into a piece of perfectly toasted bread. But if you're someone who eschews toast because of its carb count, etc. I want you to just start to think about how it may not be so bad after all. That sugar spike that comes with eating bread is diminished when it's a nutty whole grain bread and when it's topped with healthy fats and fiber-rich foods. 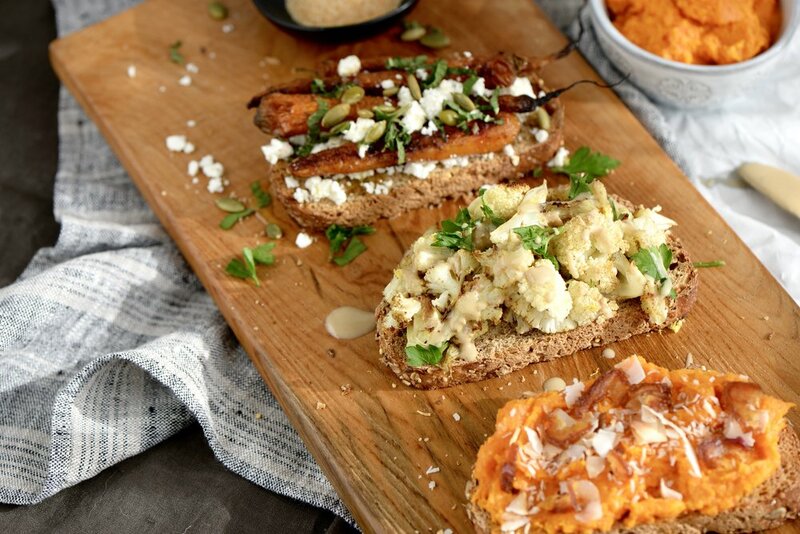 For some inspiration on how to do toast in this last month of winter, head over to Terrain's blog to check out the recipes! What are some of your favorite ways to do toast? I came down with a cold recently, and I was craving soup. As much as I love a fragrant, brothy soup like pho when I get the sniffles, my body wanted something more substantial (i.e. something that wouldn’t leave me hungry in two hours...does pho do that to anyone else but me?). Also when I’m sick, I go from having no appetite at all to suddenly wanting to devour everything in sight. Thank you, robust and raging immune system. I wanted soup, and I needed it fast. Red lentils to the rescue. They cook in 20 minutes, take minimal effort for my cold-fighting body to breakdown, and they’re full of fiber and protein that keep me satisfied. I also tossed in coconut milk for added oomph, vitamin-rich carrots because I believe veggies of any kind are instant healers, and warming spices for extra comfort. A little apple showed up for a tart-sweet flavor and because we all know that vitamin c is a force when it comes to conquering illness. I served it with brown rice, but any hearty bread would do. It also freezes well, so make a big batch and save some for later! To get the recipe, head over to Anthropologie’s blog. It’s a beautiful soup, but I must say it looks even prettier in their fancy bowls. I thought I would say goodbye to 2015 and hello to 2016 with a recipe that sums up how I approach healthy cooking day in and day out, year in and year out. This Curried Carrot Soup is a no-fuss, nourishing, delicious, and despite all of its simplicity, beautiful bowl of goodness. Certainly some of the things I whip up in the kitchen require quite a few steps- I am looking at you Chocolate and Hazelnut Praline Truffles- but then again, those lengthier processes can be a bit meditative. This soup, on the other hand, is for the majority of days, when I am cooking not for the process, but for the finish line. One pot and a mere 25 minutes, and dinner is served. I share this soup with you because it celebrates what I strive to show in every recipe post here on the blog- nutritious food that is also.....wait for it....delicious. Yes, lick-the-wooden spoon-and-perhaps-even-the bowl-delicious. I often hear people announce that they fall into two categories, that is, they "live to eat" or that they "eat to live." Being a member of the first camp implies that you eat only to enjoy, to savor, to indulge. While subscribing to the second statement implies that you eat for sustenance, out of necessity, because your body needs those vital nutrients to function. This soup, fragrant with curry and subtly sweet with coconut and a zing of fresh lemon and ginger, proves that you can have it both ways; you can eat to enjoy while nourishing yourself from the inside out. This soup just tastes good. The fact that it happens to be really, really good for you is just sort of icing on the cake...or avocado on your toast if we are going with the healthy theme. Alright, I will get to the recipe soon enough, but one more thing that made me want to finish the year off with this soup is that it is gorgeous without even trying. It is like those girls who wake up with just enough smudge of eyeliner from the night before, throw their hair in a loose ponytail, and toss on those cool jeans and that cozy sweater and just walk out the door. Needless to say I have never been one of those effortlessly chic types, but I like to channel that vibe in my food. Looks sell, and this is even more important in healthier dishes, when "plant-based" conjures up images of lettuce-noshing rabbits. In this soup, I let the natural beauty of the ingredients speak for themselves, without a mask of a heavy sauces or cloak of condiments. The golden orange comes from the carrots and curry powder, and it is just the tiniest bit tempered by the coconut milk. Cilantro, just roughly chopped, and lightly toasted coconut get dusted on for a little contrast and to compliment the southeast Asian flavors. Beauty in a bowl this is. While the soup is perfect served alongside a grain of choice or a nice whole grain bread for an everyday dinner, think about serving it as a little shooter for your next party. I promise they will want the recipe. Heat 1 tablespoon coconut oil in pot over medium heat. Add onions and saute until soft and translucent, about 5-8 minutes. Add carrots, curry powder, and 1/2 teaspoon salt, and saute until curry becomes fragrant, about 30-45 seconds. Add water and stir, making sure carrots are submerged. Bring mixture to boil, and then reduce heat to simmer. Cook 15 minutes or until carrots are easily mashed with spoon. Either transfer mixture to blender or using an immersion blender right in the pot, blend mixture until desired consistency is reached, adding coconut milk as you blend. Add freshly grated ginger, lemon juice and zest, and cayenne powder, if using and stir well. Season to taste with salt and pepper. Keep warm on low heat on the stove top until serving. Garnish with cilantro and/or toasted coconut, and serve. Enjoy! Makes 4 bowl servings or 12 shooter servings. I am sure you have all heard that carrots are good for your eyes. Or at least that is what your mother told you to get you to eat your carrot sticks. But it is true! They contain vitamin A and beta carotene which help with the maintenance of the retina. But do you know what else are good for your eye health? It turns out, a lot of things. It is undeniable that nutrition affects not only how your body feels, how your body appears, but more importantly, how your body functions. As we age, it becomes crucial to support and maintain some of those body parts and systems that start to fade with our diet. 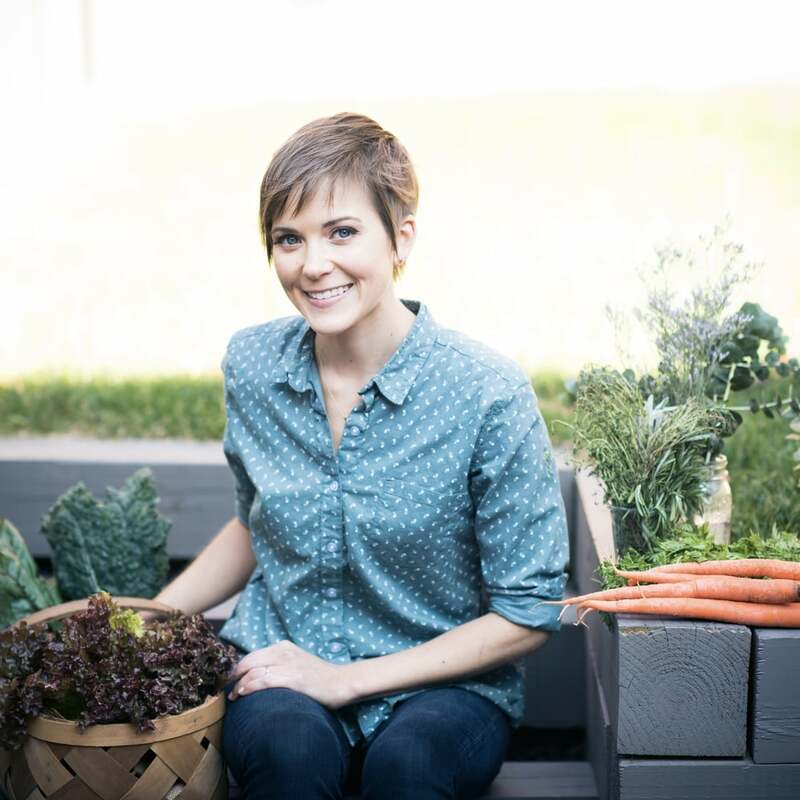 Eating consciously can help slow some of those natural processes. One such natural process of aging is vision loss. For example, age-related macular degeneration (AMD) is the leading cause of vision loss for those aged 55 and older in the United States and affects more than 10 million Americans. AMD results from the breakdown of the macula of the retina which then causes loss of central vision. You probably know someone who has experienced this incurable disease. The only cure is prevention and prevention comes in the form of a diet rich in particular nutrients. May is Healthy Vision Month and as a daughter and sister to two ophthalmologists who see how this disease debilitates so many patients, I feel compelled to share preventative measures you can take in the kitchen to help prevent eye diseases such as macular degeneration. The American Macular Degeneration Foundation (AMDF) recently released a book entitled Eat Right for Your Sight, and it is an invaluable resource to those wanting to use their diet to reduce their risk of vision loss or slow the process if it is already occurring. It not only offers an easy-to-understand explanation of the disease and lists what nutrients and how much of those nutrients are vital to healthy eyes, but it also offers original recipes with ingredients that contain those nutrients. Some recipes are contributed by famous chefs such as Alice Waters, Ina Garten, and Andrew Weil, and all are easy to read (and I mean literally- the font is large!) with readily available ingredients. I always love a cookbook with good pictures, and this one has some great ones. One particular note that I appreciated in this cookbook was the page highlighting "Good Food Combos." For example, Vitamin C enhances the absorption of iron from plant-based sources so they recommend serving citrus or strawberries with spinach. Vitamin D enhances calcium absorption. Furthermore, healthy fats are essential to optimum nutrient absorption of fat soluble vitamins A, D, E, K. They suggest pairing avocado with grapefruit, olive oil with carrots, dressing with greens, or broccoli rabe with pine nuts, as I do in my Broccoli Rabe and Chickpeas with Toasted Garlic Breadcrumbs and Pine Nuts. You can find a link to some of the recipes featured in the book here, and a link to more information about AMD and the American Macular Degeneration Foundation here. I strongly recommend this cookbook as a gift to anyone who has an older family member or friend. Or if you are of that age, it is worth the investment. It is a wonderful resource to anyone looking to understand their health and to take charge of reducing the risk of vision loss that can come with aging. These noodles are addicting. They are a little sweet, a little spicy, veggie-packed, and delicious. It recommends you choose six cups of mixed vegetables, and I chose zucchini, broccoli, bok choy, and carrots. The addition of red bell peppers would have increased the Vitamin C in the dish, but I completely forgot to pick them up from the store. The sauce comes together in a pinch and you sprinkle everything with aromatic basil, mint, cilantro, and roasted peanuts. I made a few modifications to the recipe based on what I had on hand, and you can see my changes in the parentheses. I also modified the cooking procedure just a little as it suggested to add all of the vegetables at once, but I felt certain vegetables (namely the broccoli and carrots) would need a little more time than the zucchini and bok choy. This is reflected in the instructions you see below. I added chopped scallions at the end to garnish with the fresh herbs although it recommends adding them in with the other vegetables to saute. Give this recipe a whirl- either the original version or mine. Your tastebuds will thank you, as will your eyes. Make the sauce. Combine the orange zest and juice, hoisin sauce (or peanut butter), soy sauce, chili paste, sugar (or dates), and vinegar in a bowl; set it aside. If you are using peanut butter and dates like I did, I found it easier to puree everything in a mini food processor. Combine the sesame oil and canola oil (or melted coconut oil) in a small bowl. Heat 2 teaspoons of the oil mixture in a skillet over high heat. Add the garlic and ginger and stir-fry until they begin to color, about 1 minute. Add the remaining oil mixture to the pan, and add the mixed vegetables and stir-fry until crisp-tender, 1 to 3 minutes. Stir constantly. I added the carrots and broccoli first and cooked for 1 minute. I then added the zucchini and bok choy and cooked for another 1-2 minutes or until crisp-tender. Add the noodles and reserved sauce. Cook for 1 minute more, tossing to combine. Add the basil, mint, and cilantro; toss to mix. Serve hot; garnish with the peanuts and scallions, if using. Serves 4. * To cook the udon noodles: Bring water to a boil in a medium-large pot, and add a generous pinch of salt. Add the noodles and cook for 6-8 minutes, checking for doneness around 6 minutes. You want them al dente or with just a bit of bite. Remember there will be a little residual cooking as they rest and they will be heated again in the sauce. Immediately drain and set aside while you prepare the other ingredients. Recipe from Eat Right For Your Sight: Simple Tasty Recipes That Help Reduce the Risk of Vision Loss from Macular Degeneration, By Jennifer Trainer Thompson and Johanna M. Seddon, copyright © American Macular Degeneration Foundation, 2014. Reprinted by permission of the publisher, The Experiment. Available wherever books are sold. Disclaimer: I was contacted by the publishers of Eat Right for Your Sight to review their cookbook, but all opinions are my own. Carrots are rampant at the farmers' market right now. Tender and sweet, they are begging to be the star of a dish and not just the side show. 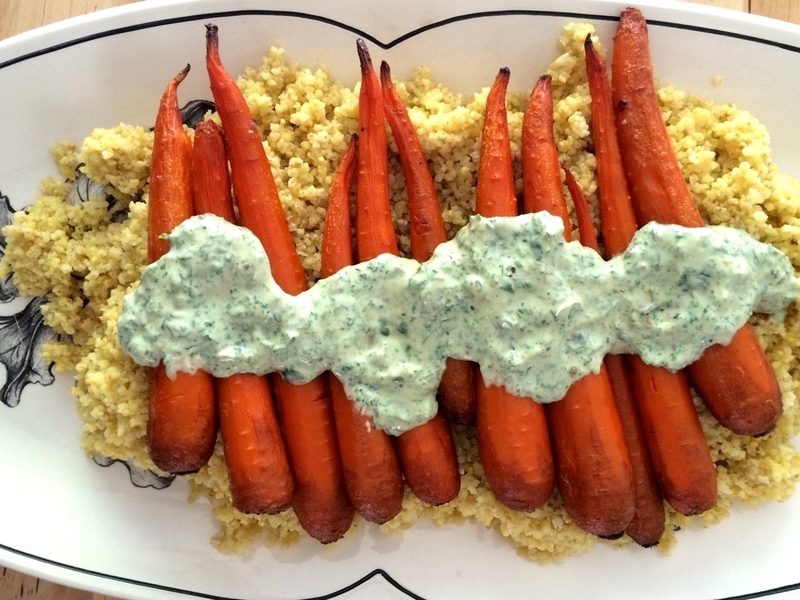 A few weeks ago, I spotted Izy's beautiful carrot dish on her blog, Top with Cinnamon, and knew I had to recreate a version of it for myself at home. 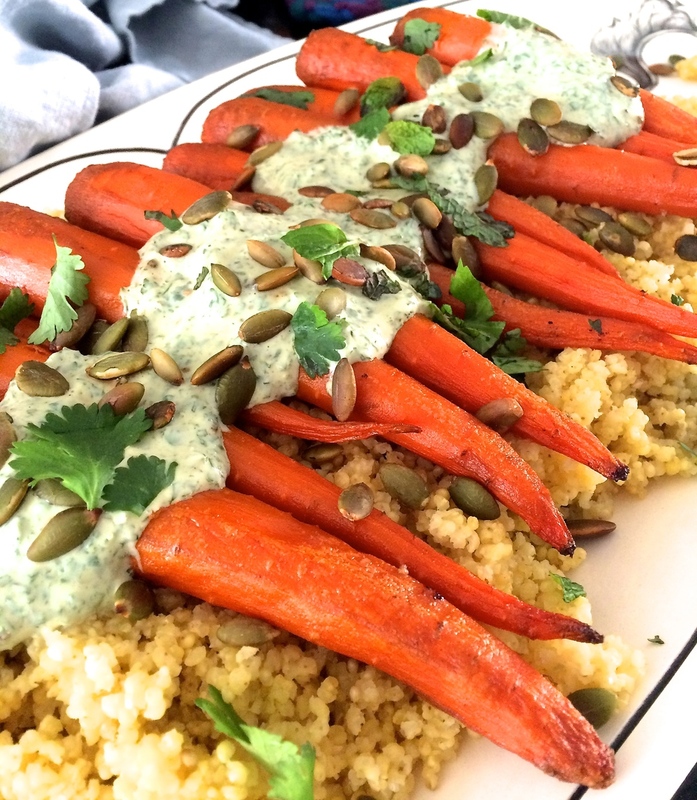 The carrots are left whole, slow roasted until they become fork-tender and a little caramelized, and then topped with an herbacious yogurt sauce spiked with funky black garlic. Now I just happened to have black garlic on hand from a recent market purchase of Obis One black garlic, but I am sure a little minced garlic sauteed slowly in a little olive oil until softened will sweeten and mellow its flavor and make a fine substitute. Or if you have roasted garlic clove on hand, even better. Mix that in for a substitute. 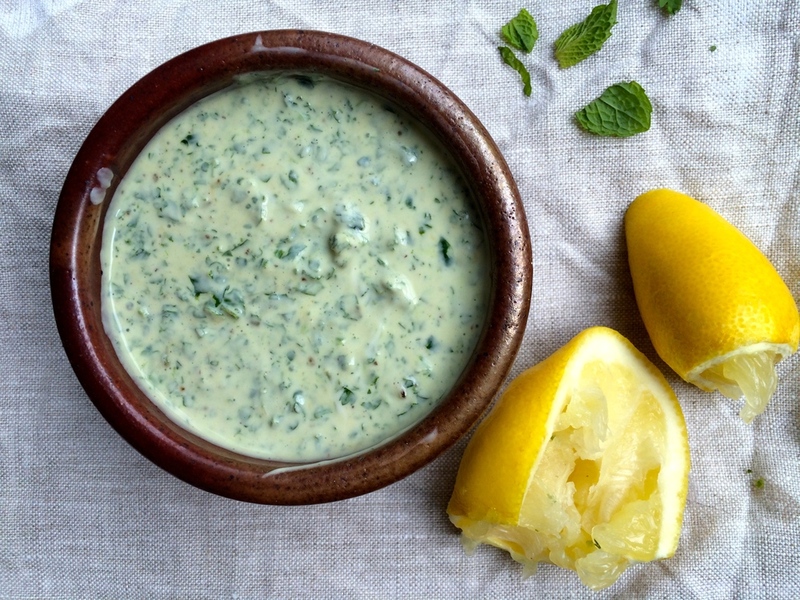 I add a bit of brightness to Izy's original version with lemon juice and zest as I love the combination of mint, yogurt, and lemon. This dish is eye-catching. I served it atop millet tossed with lemon juice, zest, salt, and a glug of good quality extra-virgin olive oil. To make it a meal, add some chunks of avocado and a handful or two of cooked beluga lentils or maybe a hard-boiled egg. This is a great dish that can be made ahead of serving time and can be eaten when the carrots and millet are warm or at room temperature. Just be sure to dollop on the cool yogurt sauce before ready to serve. Millet is a bit finicky as a grain once cooked and chilled in the refrigerator, so sprinkle it with drops of water before reheating so that it becomes soft again. Roast the carrots. Preheat the oven to 350 degrees Fahrenheit. Line a baking pan with parchment paper or a Silpat. 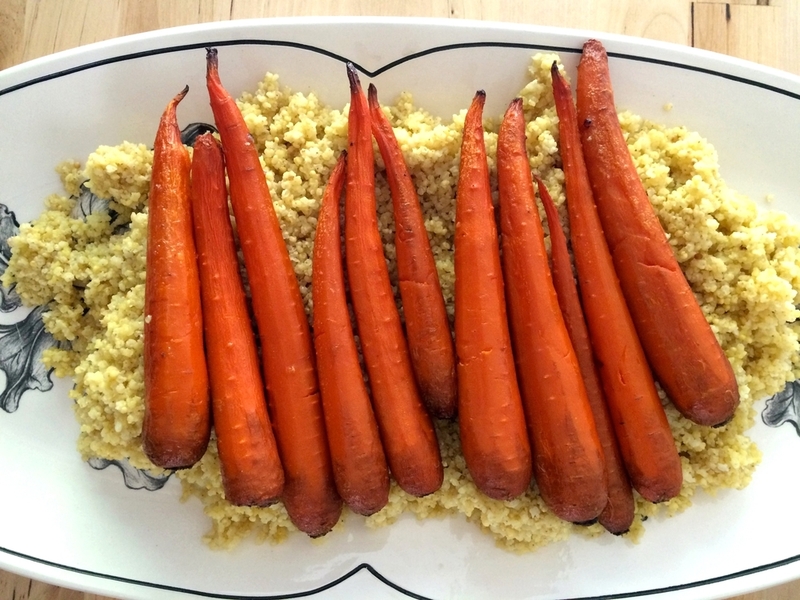 Toss the carrots with two tablespoons of olive oil and a sprinkling of salt. Mix and spread into an even layer. Cover the pan with foil and place in the oven. Bake for 30 minutes. Remove the foil, turn the carrots, and bake for 15-20 minutes more or until the carrots are fork tender and beginning to brown at the tips. Remove from the oven and set aside. Prepare the millet. Bring 2 cups of water to a boil in a pot. Add 1/4 teaspoon of salt and the millet and stir. Bring back to a boil and then reduce heat to a simmer. Cover pot and allow to cook on low for 25 minutes. Remove the pot from the heat, leaving it covered, and allow to rest for 10 minutes. Fluff the millet with a fork, add the juice of 1 lemon, the zest of 1/2 lemon, and 2 tablespoons of extra-virgin olive oil. Taste and add more salt if needed. Prepare the yogurt sauce. In a blender or mini food processor, add all of the ingredients and process until smooth. Taste and adjust for salt, and set aside.